Let’s set off to the Cultural Triangle! First stop and a chance to stretch your legs at Kadjugama, the Cashew Nut town of Sri Lanka. Purchase some of Sri Lanka’s finest nuts. A great gift for someone back at home or to keep as a snack whilst travelling around the island. If it’s your dream to feed an elephant then you must not miss Pinnawela Elephant Orphanage – home to many abandoned or injured elephants. It is one of Sri Lanka’s most visited sites.Our guests love it! Before arriving at your overnight destination - Sigiriya - make a stop at Dambulla and discover the Dambulla Caves Rock Temple dated from First Century B.C. Arrive in Sigiriya and check into the hotel. In the morning around 7:30 am leave for Polonnaruwa - a UN World Heritage Site and was the Capital of Sri Lanka from 11th - 13th Centuries. It contains some splendid and spectacular statues. After exploring the ancient ruins, head back to Sigiriya with a stop in Habarana for an 1 hour elephant back safari into the surrounding jungles. See the 5th century B.C Aukana Buddha. The most magnificent & most well preserved ancient image in Sri Lanka. 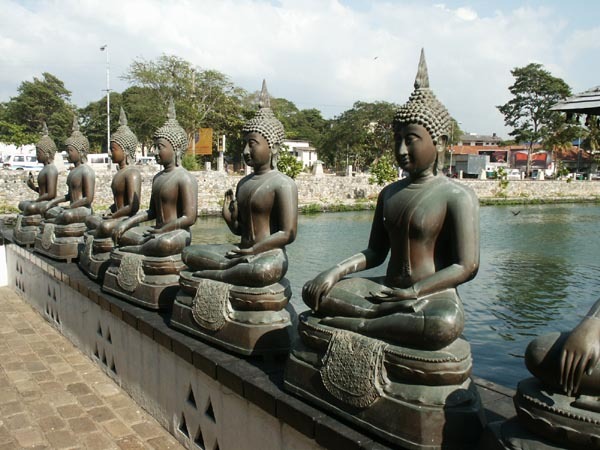 Visit our most extensive & important ancient city of Anuradhapura from 4th century B.C. Stop of at the 7th century Mahakandarawa stone bridge situated a midst a forest. Visit the local village temple and get an inside into Buddhism from the head monk. Climb to the top of the UN World Heritage Site of Sigiriya at 7am. An ancient rock fortress from the 5th Century. Amazing views of the Cultural Triangle! Continue to Kandy with en route stops. Visit an exotic Spice Garden in Matale where you can be treated to a garden tour and cooking demonstration to understand the taste and aroma of the world famous spices. It is quite touristy however everyone learns something and most love it. Also take time to see the art of batik -the ancient art of dyeing cloth using a resist. Dutch traders were so impressed by this craft that in 1835, they brought Batik artists back to Holland with them when they returned from trading trips. Wander around the lake and the streets of Kandy getting a feel for this wonderful city. For those interested in shopping for gems, antiques, clothes and leather use our shopping guide and explore the local markets and shops. - Visit the beautiful Royal Botanical Gardens and see its treasures of tropical flora. Keep an eye out for the amazing fig tree! Your driver will take your luggage and meet you at the other. It’s hassle free! Arrive in Nuwara Eliya - land of tea-laden hillsides, gurgling waterfalls, stirring mountains and clear hill-country air. Here, in temperatures akin to a beautiful English summer’s day, is wonderful walking country, a chance to experience Sri Lankan scenery at its finest. Its a early start today at 5:30 am! Take a jeep ride around Horton Plains national park a beautiful, silent, strange world with some excellent hikes in the shadows of Sri Lanka. The ‘plains’ themselves form an undulating plateau over 2000m high, covered by wild grasslands and interspersed with patches of thick forest, rocky outcrops, filigree waterfalls and misty lakes. The plateau comes to a sudden end at World’s End, a stunning escarpment that drops almost straight down for 880m. Wind past misty mountain peaks and cascading waterfalls and drive down to Yala. After a long journey, we suggest that you spend the rest of the vening unwinding, relaxing and taking in the beauty of the natural surroundings. Stop off at Dondra – Sri Lanka’s southern tip and visit the oldest stone building in Sri Lanka. Dondra was formerly home to a great temple dedicated to the Hindu god Vishnu. In 1588 the Portuguese destroyed all temples except for this one. Learn more about its colourful history when you visit. In the afternoon wander on the ramparts and explore the historic town of Galle and the 17th century Dutch Fort, a UNESCO-protected World Heritage site. Walk down Galle Forts narrow streets lined with Dutch and British colonial era buildings which are still in use, sturdy ramparts looking out to sea, the lighthouse, and a growing collection of art galleries. There is so much to discover and it is best to do it on foot. Drive along the west coast to Colombo. The sandy beaches are the main attraction in the string of small towns such as Kalutara, Beruwela, Bentota, Ambalangoda, Ahungalla and Hikkaduwa, but they also share a vibrant cultural heritage including folklore, music and dance as well as architectural influences from the Dutch period. Visit Kosgoda’s Marine Turtle hatchery – a valuable conservation project that protects the endangered Marine Turtles of Sri Lanka.